YONI KULENDI, a lawyer says the Attorney General and Minister of Justice Betty Mould Iddrisu exercised her discretion ‘wrongly’ in her bid to prosecute Dr. Charles Yves Wereko-Brobby aka Tarzan and Kwadwo Okyere Mpiani for causing financial loss to the state in the matters of Ghana@50. 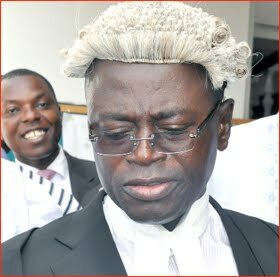 Dr. Wereko-Brobby, a former Chief Executive Officer of the defunct Ghana @50 Secretariat and Mr. Mpiani, former Chief of Staff in the erstwhile NPP administration and also the Chairman of the National Planning Committee for the celebration have been put on trial by the National Democratic Congress (NDC) government for the various roles they played during the 50th Independence Anniversary and the 2007 African Union Summit hosted by Ghana. However, the two NPP stalwarts are saying that the charges preferred against them by the state “is a violation of their constitutional right under Articles 278 (1) (a) and 280 (1) (2) (3) (4) (5) (6) of the 1992 Constitution,” but the state insists the two men have a case to answer in the Ghana @ 50 celebrations. At their maiden appearance, the two accused persons pleaded not guilty to four counts of willfully causing financial loss to the state and were granted GH¢ 35 million self-recognizance bail. Concluding his final argument in the application for an order to strike out and dismiss the charges against Mr. Mpiani and Tarzan, in Accra yesterday, Mr. Kulendi said the setting up of the Commission of Enquiry and its subsequent use as a pre-prosecution tool was abandoned as far back as far back as 1969 when the second Republican Constitution was promulgated and the 1992 constitution had even come to make issues much clearer. He said the affidavit filed by the state to oppose the application of Mr. Mpiani and Dr. Wereko-Brobby got the issues wrong saying “you mount prosecution based on the Commission’s report and when you are confronted with a protest you try to bring new facts. The Chief State Attorney, Anthony Gyambiby who is the prosecutor is expected to move a motion opposing the applications filed by Dr. Wereko-Brobby and Mr. Mpiani today.